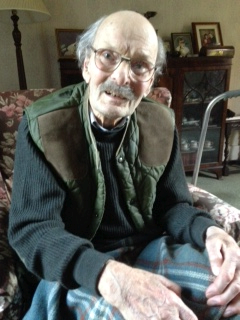 Bill Hays lived in the High Street and had been a Harston resident since his birth in 1920 till his death in Dec 2014. His family have lived in Harston for seven generations, moving here to farm in the 1770s, living first in a cottage in Button End. The Hays have always been involved with farming, and have seen the ups and downs of agricultural life over a long period. Bill also remembers talk of the coprolite mining that went on in Harston in the second half of the nineteenth century. He recalls a brick tunnel that had been used for transporting coprolites, that collapsed one day somewhere behind Park House. Bill’s father farmed at Rectory Farm, Beech Farm and Baggot Hall Farm. The 1920s were a particularly difficult time for farming, which did much better during and after the Second World War. Bill’s father was bankrupted in the 1928-32 depression, and had to sell Beech Farm. He kept the tenancy of Baggot Hall Farm, farming land that was owned by the Hurrells and Jesus College. Bill grew up living with his family in Baggot Hall which his father had bought before the First World War. Bill started school aged seven at the Perse Prep and went on to the Upper School in 1932, leaving in 1937 at the age of 17, to work on the farm. At this time, they were farming 500 acres and employed 13 men. The first tractor arrived when Bill was 12, but horses were still important and he remembers there being seven to work the land. Harvest was a time for celebration and Bill’s father had all his workers in for the Horkey Feast, held in a barn, after the harvest was gathered in, and would hire a conjuror to entertain them. The Hays grew sugar beet into the 1980s and Bill remembers it being loaded onto goods trains at Harston station to be taken to Ely. They kept cows at Rectory Farm, and Bill’s father started the milk round with a pony and cart, setting out around Harston at 8 in the morning. Bill still has an old three-wheeled horse-drawn milk float that carried churns, in the days before milk was bottled, from which the villagers filled their jugs. The Harston Dairy soon expanded to serve all the surrounding villages. Bill’s mother’s family, the Smiths, were the local millers. Bill’s grandfather had the old wooden Harston Mill rebuilt in stone, and the family at various times also had the mills at Royston and Barrington. Bill remembers flour being transported from the mill to Harston Station in covered carts. The millstones were powered by water until the first World War, and then by steam. The Smiths at Harston Mill had the first car in the village. Bill remembers the Baggot Hall of his childhood as a big rambling house. It was lit by oil lamps and Bill had a candle to light him to bed. In the evenings he was sent with letters to the Post Office (then on the corner of High Street and Church Street), carrying a lantern on the unlit roads which had no paved footpaths running beside them. There was no electricity until the late 1930s. Mains water arrived in Harston around 1938. Before then, people relied on the artesian wells, and several stand pipes around the village, from which they carried water home. Bill’s father had a 220 foot deep well dug in the front garden which overflowed into a fountain, and water was pumped from there to the cattleyard. Before refrigeration, Bill recalls putting milk and butter into the fountain to keep it cool. Bill cycled into Cambridge to school, or took the bus. His father had a car before the First World War, but cars were few and far between before the Second World War, and the roads were quiet. (Some other villagers remember playing football on the road through the village that is now the busy A10!) On Sunday mornings, Bill went to All Saints, the parish church, where Reverend Ward was the Vicar. In the afternoon all the villagers came out to socialise, in their best suits and bowler hats. Bill left school in 1937, the year in which Helen Greene wrote her book on the history of Harston. He remembers Helen and her sister Polly, who lived at Harston House, being very sociable. They held firework parties to which all the children of the village were invited. He also has many memories of the Willers, another longstanding village family, who were wheelwrights on the High Street, made coffins and ran the funeral business, and kept the village shop.